The Magnet Lab main light source is a high power Ti:Sapphire amplifier system (10 W average power output) with tunable repetition rate ranging from 30 kHz to 100 kHz. This is used to generate a wide variety of wavelengths spanning from the Visible/Near-Infrared (475 nm to 2600 nm) to the Extreme Ultraviolet (60 nm to 30 nm) wavelength range. In addition, the lab also houses two other low power, 80 MHz ultrafast laser system, a 17 T superconducting DC magnet (for which the lab derives its name) and a time-of-flight electron microscope (to be installed in Feb 2018). 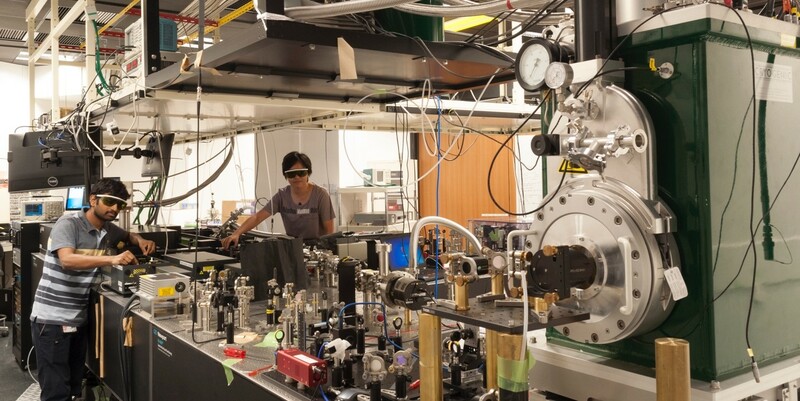 These capabilities allow us to conduct two-color pump-probe spectroscopy and THz time-domain spectroscopy in B-field, as well as time-resolved photoemission electron microscopy with the EUV light source (in the future). ​Page last updated on September 05, 2017 (EW/CP).